President Donald Trump’s appointment of former UN ambassador John Bolton to national security adviser has led people from both parties to raise concerns about his views. Former President George W. Bush’s national security adviser said he is concerned about Bolton’s views, as did Gov. John Kasich and others. Sen. Time Kaine raised doubts about Bolton’s ability to gain a security clearance in the White House. Bolton has been decried as a hawk with anti-Muslim views by his opponents. Lawmakers, former advisers, and generals weighed in on President Donald Trump’s latest staff shakeup on Sunday. Trump named John Bolton to be his national security adviser on Thursday, replacing Army Gen. H.R. McMaster. Bolton, who served as former President George W. Bush’s US ambassador to the United Nations, is slated to succeed McMaster next month. But his hawkish stance and highly controversial views on Muslims have led officials from both parties to express deep-seated doubts about his selection, while some say a diversity of opinions in the White House is a good thing. Even those who offered words of support for Bolton said they were concerned about some of his views. Former Chairman of the Joint Chiefs of Staff Mike Mullen, who served under both Bush and former President Barack Obama, said Bolton’s appointment is certain to change US foreign policy. Ohio Gov. John Kasich, a Republican, said Bolton’s position on pre-emptive strikes are troubling. 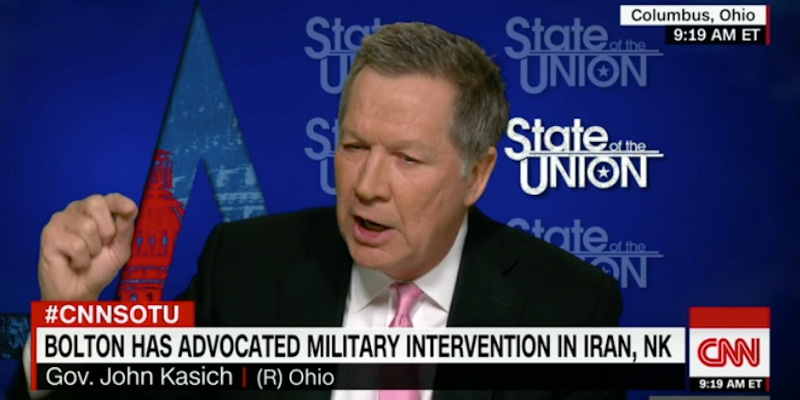 Although Kasich said it is important for the president to hear out a diversity of views about foreign policy issues, he added that the US should not be taking aggressive stances toward other countries by default. Former Bush national security adviser Stephen Hadley agreed, and said Bolton’s views are a matter of concern for him, but do not necessarily mean the US will go to war anytime soon. Ethan Miller/Getty ImagesFormer United States ambassador to the United Nations John Bolton speaks during the Republican Jewish Coalition spring leadership meeting at The Venetian Las Vegas on March 29, 2014 in Las Vegas, Nevada. Sen. Tim Kaine, a Democrat, said Bolton’s foreign contacts might become a serious hurdle to his obtaining a security clearance to work in the White House. Security clearances in the White House have become an increasingly pressing issue since former White House staff secretary Rob Porter’s domestic abuse scandal. Porter had been operating on a temporary security clearance as the FBI investigated past violent behaviour his two ex-wives alleged. White House chief of staff John Kelly instituted new guidelines related to security clearances amid the Porter scandal that he said would help close some loopholes. Last month, all White House aides who held interim top-secret clearances were downgraded to “secret,” Politico reported. Bolton was reportedly been under consideration for secretary of state after Trump’s electoral victory in 2016. 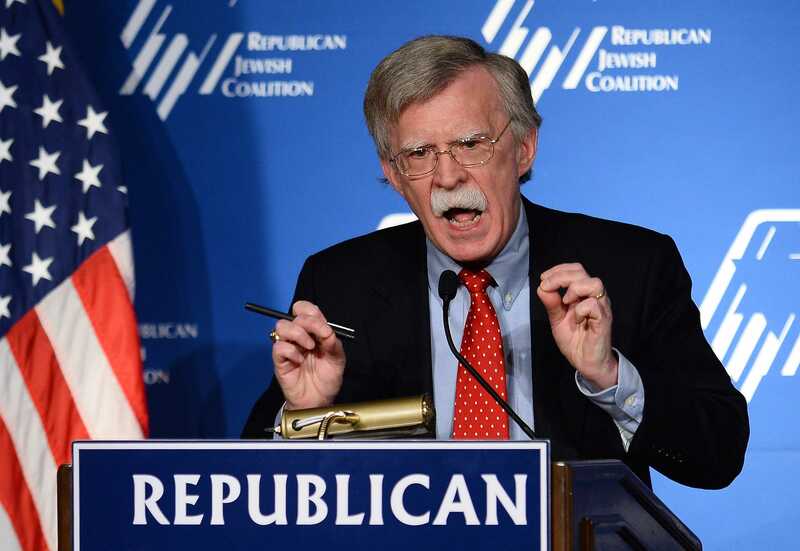 In addition to his hawkish rhetoric on Iran, North Korea, and other countries, Bolton also sits on the board of a think tank that often pushes misleading information about Muslim refugees in Europe, and presents them as an existential threat to the Western world. He has received $US310,000 from the organisation, according to The Intercept.